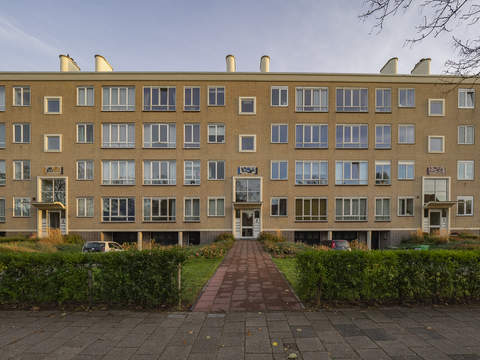 Beukstraat 137 Price asked € 275.000 k.k. Atmospheric, light and spacious 4-room top apartment where many original details have been retained, with licensed roof terrace in active Owners Association. Open porch, entrance with new front door in original style on the 1st floor, vestibule with a fixed cupboard and space for bicycles or a pram for example. Via the staircase with original barred fence you reach the spacious hall on the 2nd floor. Above the staircase the roof light provided with rods and colored glass provides a lot of light. In the hall there is a fixed cupboard with washing machine and dryer. The modern bathroom (2017) approx. 2.09 x 2.07 is equipped with a bath / shower combination with built-in shower faucet, toilet, bathroom furniture, heated mirror with lighting and built-in cupboard. The spacious and bright bedroom in the front approx. 3.05 x 4.41 has 4 windows and practical storage space. In the lovely room en suite, approx. 5.11 x 3.76 and 5.81 x 3.73/2.85, many authentic details are present, such as the sliding doors with stained glass and 4 fixed cupboards, original frame ceilings, fire burner and black marble fireplace. Through the sliding door you reach a small balcony approx. 2.85 x 0.95 with an unobstructed view of the deep and well-maintained gardens. The bright kitchen approx. 3.70 x 2.59 has on one side an original kitchen unit with a granite worktop and display cabinet. On the other side a modern kitchen unit with a 4-burner gas stove, oven, dishwasher and original fireplace. There is also an access to the small balcony. The bedroom at the back approx. 3.70 x 2.63 is a nice second bedroom with a custom made cabinet wall with handle-free oak veneer doors. Finally, from the hall with a loft ladder the beautiful and (mostly) sunny roof terrace approx. 6.09 x 4.09 can be reached. This is equipped with a balustrade and storage space for example cushions and the barbecue. • NVM model deed applicable. 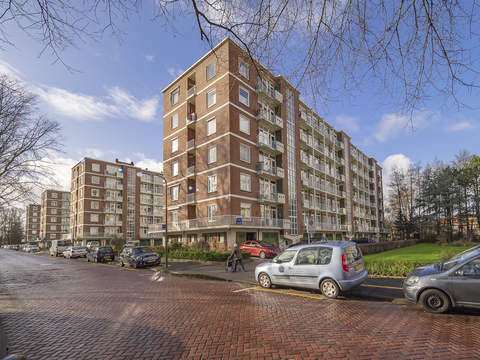 In the recently redeveloped Fahrenheitstraat and Thomsonlaan all desired amenities are within walking distance such as shops, terraces, restaurants, playgrounds and public transport (RandstadRail line 3 and tram 12). Also the beach, Westduinpark, Bosjes van Poot, Bosjes van Pex, Prins Hendrikstraat, Frederik Hendriklaan and the Center are easy to reach. Finally, the International and European School of The Hague, various primary schools and sports facilities such as tennis, football, hockey, horseback riding and handball can be found in the immediate vicinity. Roads through Hubertus tunnel and Westland route.